*Step aside Super Bowl because these basketball stars aren’t gonna stop ballin’ next weekend. Football stars will not only be present in NYC during the highly anticipated Super Bowl, but basketball pros are playing in NYC as well. 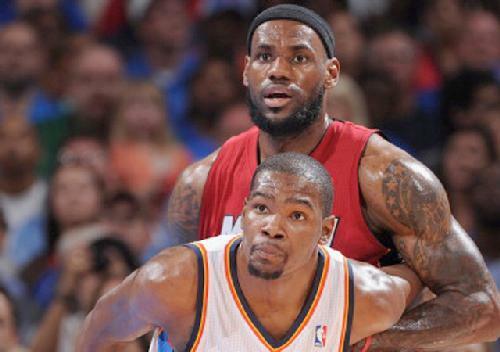 LeBron James and Kevin Durant are among basketball celebrities set to play during a weekend dominated by the Super Bowl. The New York Knicks and Brooklyn Nets are playing for their city next weekend against the Miami Heat and Oklahoma Thunder. “Knowing that the sports world was going to descend on New York City for the Super Bowl, we knew that there would be enormous demand to see the Knicks and the Nets play, so we accommodated that interest by scheduling marquee games,” NBA spokesman Mike Bass said. Durant and the Oklahoma Thunder are balling against the Nets next friday before James and the Miami Heat take on Carmelo Anthony and the Knicks next Saturday. “A chance to put on a show, the weekend of the Super Bowl, in New York City, is something that you know they’re going to embrace and try and make the most of,” ESPN’s Mike Breen said. And maybe the Knicks are ready to crush the Heat on their territory. “Regardless of whether the Knicks are playing well or struggling, to this day, to a man, these players, they treasure coming to the [Madison Square] Garden and playing at the Garden,” Breen said. Regardless of winning or losing, don’t expect stars from the Heat coming into NYC next weekend to stay after the game. James is returning home.